Dale Earnhardt won ten Cup races at Talladega, the last being in October, 2000. From October, 2001 until April, 2003, Dale Earnhardt, Jr. won four Cup races in a row at this track. His streak was broken by his teammate at DEI, Michael Waltrip in September, 2003. Between 1999 and 2005, Bobby Hamilton and Michael Waltrip were the only winners not named Earnhardt or Gordon. Among active drivers, nobody has more starts at Talladega than Bill Elliott with 54 starts. The most of all time, though, was Dave Marcis with 61 starts. Are We There Yet: Have Crock-Pot, Will Travel... to Martinsville! There have been 123 Cup races at Martinsville where they started racing in 1949. That first race was a field of 15 drivers. The last eight races at Martinsville have been won by the drivers that are first and second in points right now. Jimmie's won five of them and Denny's won the other three. Good luck to everyone else. Up until 1970, the track was listed as exactly half a mile (.500 miles), but then was changed to be officially .525 miles. That lasted until 1984 when it was changed to be .526 miles. From 1960-1974 Chevy failed to win a race at Martinsville. Since 1974, however, Chevy has won 54% of the Cup races here, with 39 victories in 72 races. There are seven "Triple D" eateries in North Carolina. All of them are in Charlotte. Barbeque King Drive-In, Penguin Drive-In, Jake's Good Eats, Landmark Restaurant Diner, Dish, South 21 Drive-In, and Cabo Fish Taco. David Reutimann has one Cup win at Charlotte. Kyle Busch has none. Bill Elliott has started the most races at Charlotte, with 61. Mark Martin has the most of any full-time driver, with 51. There have been just nine cup races at Kansas Speedway, and guys that currently race for Hendrick (directly or indirectly) have won seven of them. Jeff Gordon, Jimmie Johnson, Mark Martin, Tony Stewart, and Ryan Newman...who's missing on that list of Kansas winners? 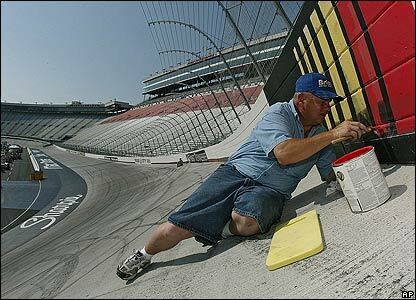 In 2004, Joe Nemechek swept the weekend of Nationwide and Cup races here. In 2007 the race was shortened by rain. And it was a LOT of rain. Greg Biffle won that race under questionable circumstances, out of fuel, and not keeping up with the pace car. He still maintains he wasn't out of fuel. And Darrell Waltrip still maintains he didn't blow up his engine on purpose after the All Star Race, too. The furthest back a winner has started the race is 27th in 1995. Kyle Petty was that winner. Dover was founded in 1683 by William Penn. Jeremy Mayfield set a qualifying record at Dover in 2004 with a speed of 161.522 mph. In 1971, there was a caution-free race at Dover. Bobby Allison won the race after starting on the outside pole. Denny Hamlin jumped nine spots in the points standings this week. He also has nine starts at Loudon. He has one win and six top-tens. Jimmie Johnson gained five spots in the points this week. He's also raced more than five thousand miles at Loudon. In 17 starts, he has 3 wins and 12 top-tens. Kevin Harvick lost two spots in the points with the reset. He also has tallied more than two million dollars in winnings. In 19 starts, he has one win and ten top-ten finishes. The anthem will be sung Saturday night by Staff Major Sergeant Cynthia Seaman. As a note, though, Richmond had a national anthem contest and the winner, Ryan Corbin, will perform on Friday night. The last time this race was run on 9/11 was 2004. Jeremy Mayfield won. Jimmie Johnson has won two of the last three fall races at Richmond. Dale Earnhardt, Jr. is a three-time Richmond winner. He's tied for most wins among active drivers with Jimmie Johnson and Tony Stewart. That record pales in comparison, though, to Richard Petty's 13 wins. Are We There Yet: $49 Concert Tickets Also Get Small Sponsor Patch View! In 1986, Morgan Shepherd, in an unsponsored, part-time ride with Jack Beebe, beat Dale Earnhardt, when the #3 just couldn't pass him. He later went on to claim the last win for the Wood Brothers who have more wins at Atlanta than any other organization. Ryan Newman and Buddy Baker are tied for the most poles won at Atlanta, with seven each. Joe Gibbs will be giving the invocation this week. If you have aspirations of ever doing that at a race, pay attention - Coach will show you how it's done. What does the banking REALLY look like? 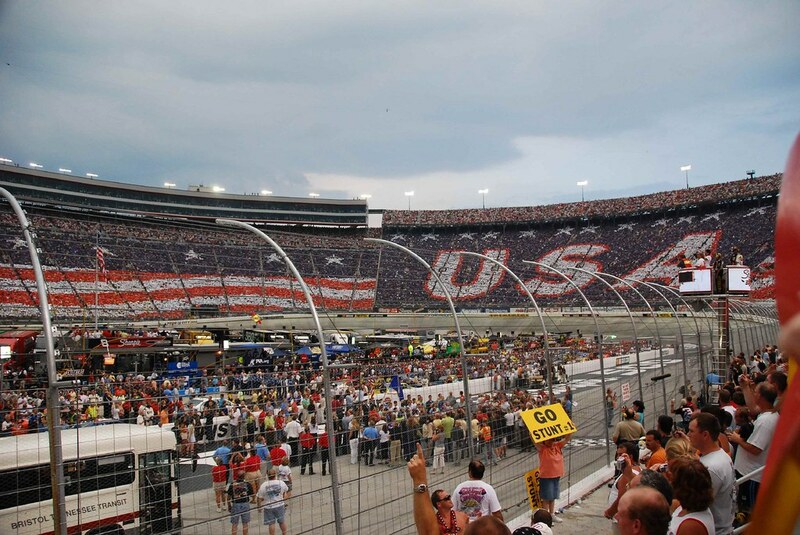 What's so great about attending a Bristol race? Why do they call it a cereal bowl? Population in Brooklyn is about 1,200 and they have seven churches, five banks, three golf courses, two laundromats, and just one Home Party Consultant. There are 24 restaurants, only four of which are fast-food. There are three Wal-Marts within twenty miles of Brooklyn. The village was founded by Calvin Swain in June of 1832, and he called his settlement Swainsville. The town voted to change the name just four years later to Brooklyn. Ingrates.